﻿ Congresswoman Rosa DeLauro Meets With Apricus Inc.
Home » Latest News » Congresswoman Rosa DeLauro Meets With Apricus Inc.
Congresswoman Rosa DeLauro Meets With Apricus Inc.
Connecticut Congresswoman Rosa Delauro visited with Apricus Inc, the US subdisiary of the global company, and their partner Engineering Specialties Inc. (ESI), a manufacturer of engineered metal stamping, mechanical assemblies, and other custom component parts, on Tuesday, April 3rd. 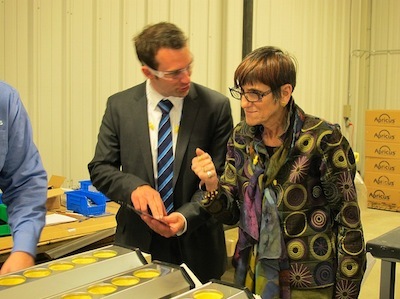 DeLauro toured both the Apricus and ESI factories to learn more about their collaboration and efforts to produce a solar thermal product locally. The two Connecticut-based companies partnered in early 2011 on the AP-30C, an evacuated tube solar collector that exceeds the requirements of the Buy American Act and is suitable for projects funded by the American Recovery and Reinvestment Act.